MainAll NewsJewish WorldSlurpees are Here, and You? Slurpees are Here, and You? Freezee, the Slurpee style slush drink, can be found in a number of stores in Israel. Some say that this helps them come and stay in Israel. 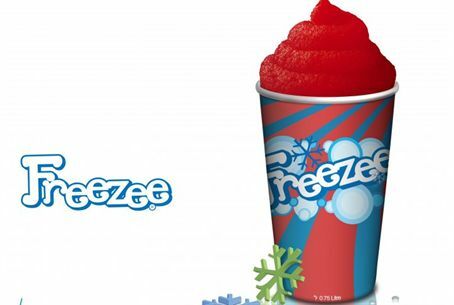 Freezee, the Slurpee style slush drink, can be found in a number of stores in Israel. The managers of Freezee say that some of the clients have told them that this opportunity helps them come and stay in Israel, they've heard many reactions like "If there's a slush like this in Israel, we can now make Aliyah" and "With Freezee here, I don't need to visit the US to much". The company says that Freezees have an advantage over all others when it comes to flavors "We have started in Israel with a few solid favorites such as Cola, Cherry and Raspberry. However, we have Mountain Mist waiting in the wings and a huge number of flavors to choose from in the future. Almost any flavor you can find in the U.S., we can bring to Israel. (Of course, it has to pass our Mehadrin Kosher certification from the Star-K and the various rabbinic organizations here in Israel)." Israel National News TV met the Freezee machine at the IsraFood Expo in Tel Aviv.